The direct address here works twofold, invoking not only the goddess of wild animals, wilderness, and the hunt, but also casting her presence as context for the way in which this poem and the poems that follow view the female body. Through the imagery of “ovarian horns,” a complicated gesture is made. The speaker asks the goddess to possess and charge the physical body with meaning, and, thus, let the body be enough. This direct address also subverts the go-to opening of ancient epic poems (“Sing to me, O Muses,…”), only instead of commanding muses to act on their behalf, the speaker here claims both goddess and the female body as being active by being present. This presence-as-action note is further emphasized in the poem’s soundplay of “speak / my / grizzly / bear / lips,” where “bear” evokes its homonym “bare,” adding bravura and vulnerability to an already complexly layered short lyric. Here, it is word choice that drives home the emotional tension of the poem. An affair in which the two are akin to “vermin” would seem unflattering except that this conceit allows for the later “loll / suckling” which connotes a tenderness not immediately associated with the word “vermin.” By placing both words as part of the metaphor, this short lyric draws out meanings beyond initial impressions and shows need and want as integral to both animal and human experience. Young men are always encouraged to travel, taught they are destined to be gentlemen and explorers…They are told it is their duty to return to land and tell tales, but the rite of passage is hers. Here, the speaker addresses the other side of the dichotomy, the assumed power of males in the traditional sailor narrative. By stating that “the rite of passage is hers,” however, the speaker takes back agency. The acted upon and passive ship becomes redefined as active via its presence, returning us again to the theme found in the proem. Yet, where in the proem one’s presence as action is an act of boldness, here one is engaged in a mix of pathos and world-weariness. The defiance (against tradition, against gendered tropes) inherent in getting to the wisdom of this ending comes at the cost of disenchantment. left on the ground for hours. The world allowed to fester. Word choice again plays a key role in this personal and political reckoning. The phrasing of “not meant to mate” (emphasis added) drives home the nature of words and their power. Throughout, this collection holds that words are human, and “mate” through meaning. With this understanding in mind, when “A solitary man, so used to his podium, / [reads] an autopsy as art,” that act is one of trying to separate language from its ingrained humanity, as if even the words of an autopsy weren’t still about a human being. 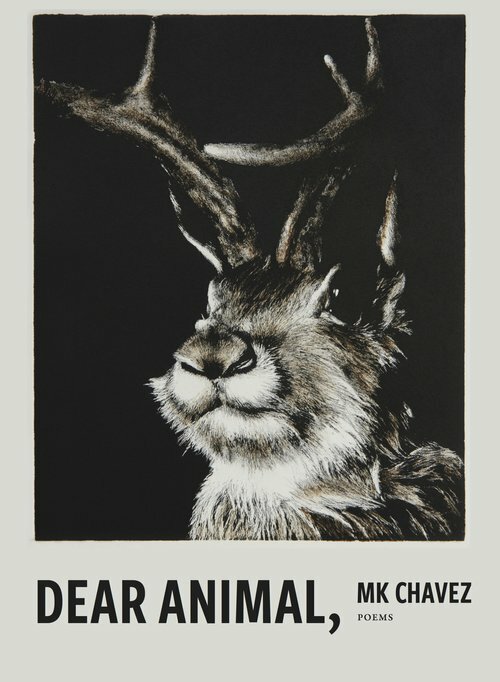 When humans—we thinking animals—become the subject of Chavez’s poems, one feels the weight of the word “dear” in the collection’s title. Language in many ways implies distance; our immediate experiences are also at a distance, the distance of memory and understanding. Yet language and memory can serve as a way to cross that distance and connect with our humanity and what, in fact, is dear to us. Writing Prompt: Pick a favorite mythological deity or conduct some research into mythologies that interest you. Collect facts, interpretations, and associated words that you are drawn to. Then create an invocation in the style of “Artemis,” addressing the deity directly in a contemporary way. What would cause you to invoke said deity? What would you talk to them about? What would you ask their help and insight on? Would you gossip with them, or rage? Be sure to braid your own obsessions/fascinations into the narrative. José Angel Araguz is a CantoMundo fellow and the author of seven chapbooks as well as the collections Everything We Think We Hear, Small Fires, and Until We Are Level Again. His poems, prose, and reviews have appeared in Crab Creek Review, Prairie Schooner, The Windward Review, and The Bind. He serves as an editor for the journal Right Hand Pointing and is on the editing staff of Airlie Press. He runs the poetry blog The Friday Influence and teaches English and creative writing at Linfield College in McMinnville, Oregon.